Description: A majestic Moose and Black Bear meander along the shore of a woodland lake while the early morning Sun rises. 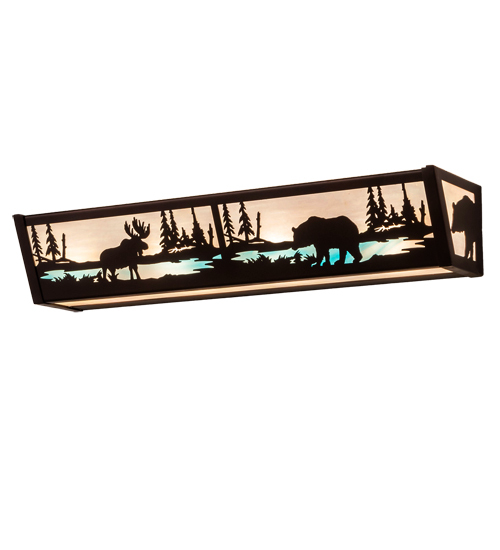 This luminaire features an image that is perfect for a picture postcard or a great work of art. This linear shade features White Iridescent Art Glass for the Sky while Sky Blue Opal Glass represents the sparkling lake. The fixture is enhanced with decorative accents, frame, and hardware featured in a Mahogany Bronze finish. Ideal as a vanity light in fine baths or a wall sconce in other rooms. Custom crafted by highly skilled artisans in our 180,000 square foot manufacturing facility at the foothills of the spectacular Adirondack Mountains in Upstate New York. Custom options available. UL and cUL listed for dry and damp locations.